A Graveside Service will be held on Wednesday February 6, 2019 at Beaverdale Memorial Park at 10am with Reverend Bash doing the Committal Service. 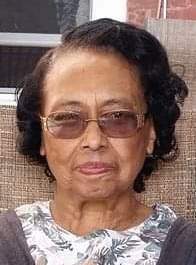 Catherine (Williams) Johnson, age 80, of New Haven, entered into eternal life on Thursday January 31, 2019 at Mary Wade Home. Born on June 16, 1938, in Raleigh, North Carolina, daughter of the late John and Novella (Carrington) Williams. Loving mother of Dorothea (Stanley) McWilliams of New Haven, Roberta Johnson of New Haven, and Robert Johnson Jr. of Virginia Beach. Also survived by 6 grandchildren, 6 great grandchildren, and 1 great great grandchild. She retired at the age 55 as a supervisor from the New Haven Post Office, and then she moved down to Virginia Beach. She was a faithful churchgoer.